As a child, I loved stuffed animals. I had tons and tons of them, many of which had to be bagged and placed in our attic because they outgrew my room. It was an excessive obsession, I admit, but my attraction to plush continues today in a more restricted way with my children; however, most plush is made from polyester fibers and/or polystyrene. There’s nothing natural about this plastic made from petroleum by the chemical industry, and certainly this is not a substance I want my children snuggling with at night. 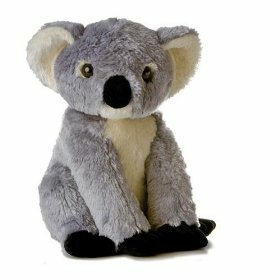 Aurora Naturally Plush offers an eco-friendly alternative to chemically manufactured stuffed animals. Handmade in Indonesia, Aurora Naturally is made from 100% soy bean fiber and stuffed with Kapok, which is a sustainable rain forest crop. Not only are these stuffed animals eco-friendly, they are very soft and nice. I have had extended family members comment on how nice they are without knowing they are eco-friendly. 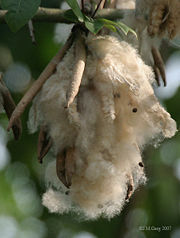 Furthermore, you can educate your children about the eco-plush’s ingredients by reading The Great Kapok Tree. My daughter has the Aurora Naturally Koala Bear, and my son has the brown bear. These stuffed animals quickly became favorites and took their rightful place in my children’s beds. These are the stuffed animals that must travel with us on overnight trips, and I am happy that they replace the petroleum-based plush my children used to adore. I plan to give my niece an Aurora Naturally Plush toy this holiday season. Aurora is the leading manufacturer of plush toys, and hopefully one day the entire line will be eco-friendly. The company makes donations to “worthwhile” causes to such as CASA of Los Angeles, In Defense of Animals, William Shatner’s “Ahead with Horses”, and Hollywood Charity Horse Show to demonstrate social responsibility. Remember the green power of the purse/wallet? If consumers purchase eco-friendly products, companies will respond by providing more of these green products. I was going to write a review but guess you beat me to it.